Grief and Loss impacts Everyone. 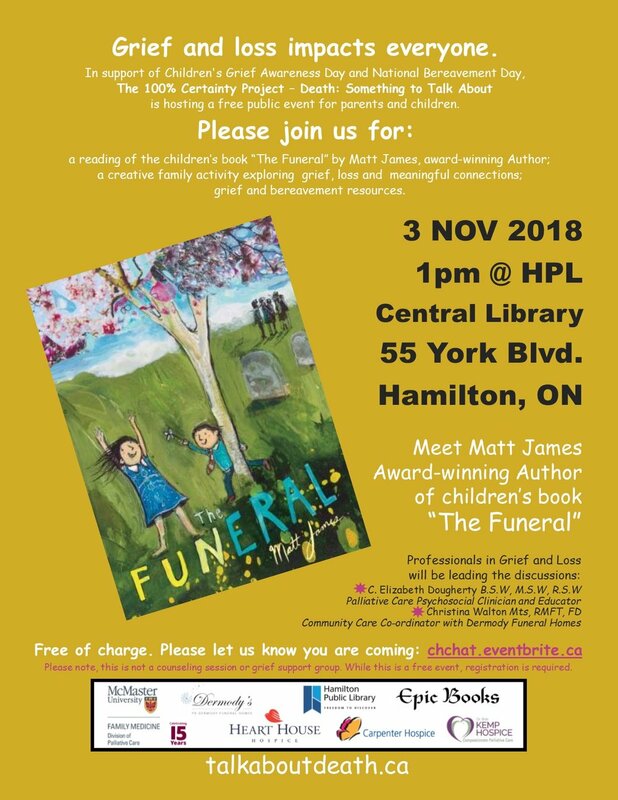 CBC Books on The Funeral: "This sensitive and life-affirming story will lead young readers to ask their own questions about life, death and how we remember those who have gone before us"
Please note, this is not a counselling session or grief support group. 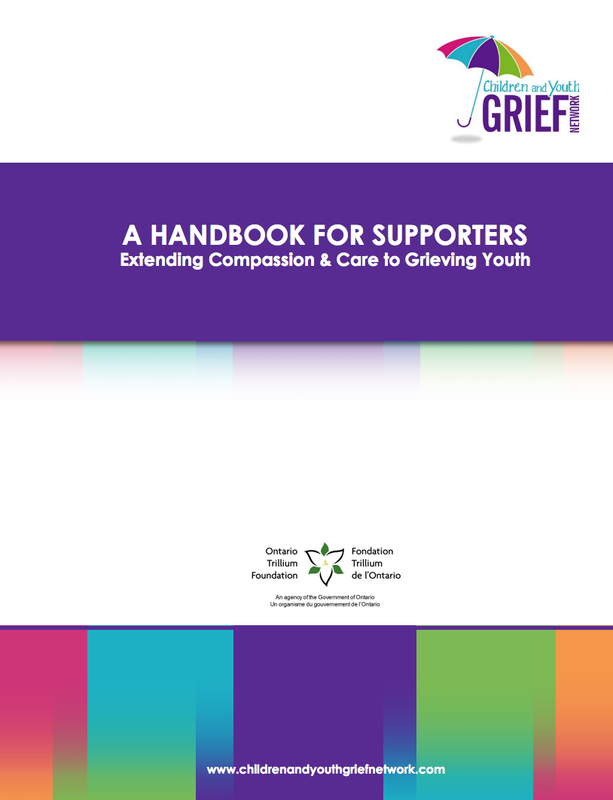 Am honoured to have been part of the development team for the latest resource, Kids Grief, which was just launched on the first National Bereavement Day in Canada. I believe it is important to share these valuable resources for individuals and families facing illness, uncertainty, grief and loss. This information is also helpful for any healthcare professional or volunteer wanting more information and resources when providing support in acute care, primary care or within a community setting. 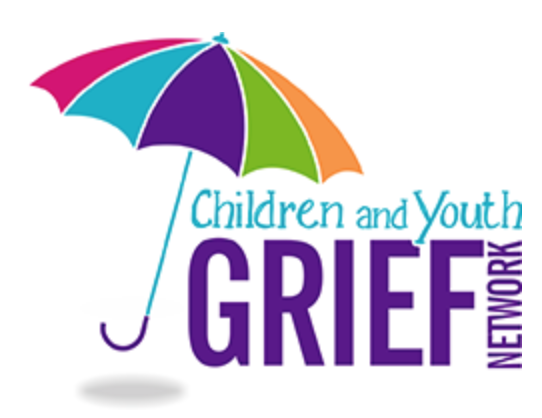 Am honoured to be a new partner agency with the Children and Youth Grief Network (CYGN). The CYGN is a collaborative of agencies and organizations that work to support grieving families of all ages. The CYGN recognizes that "the support received by a grieving child or youth can significantly influence his/her wellbeing. As a result we aim to connect individuals and organizations who provide services and resources that benefit children and youth who are grieving a death." As the CYGN Mission is "to advocate for educational opportunities and support services that will benefit children and youth who are grieving the dying or the death of someone they care about", in support of National Bereavement Day, the CYGN is offering 2 free community events to support grieving families. These events are intended for parents/caregivers and their children/teens (under 18 yrs of age) who have experienced the death of a parent/caregiver, child/sibling. This event is offered for the whole family. Children will participate in facilitated creative activities with trained grief experts, while parents/caregivers will attend a panel presentation and discussions to explore coping strategies and grief support featuring grief professionals and other bereaved families. Come explore grief and bereavement coping strategies specifically for families with children and teens. Connect with peers and learn more about the resources available in your community while enjoying the support of caring professionals and other families who share the grief experience. Snacks, local grief and bereavement resources and gift bag included. Reserve your FREE Ontario Children's Grief Awareness Family Day seats via Eventbrite. 2 Dates and 2 Locations! "There is a cultural narrative that tells us that bad things don’t happen to good people. As a result, we spend a lot of time protecting kids from natural life events, like death." "This one page handout provides an overview of the findings from a research study of parent caregivers. The study was conducted as a collaboration between Dr. Jay Children`s Grief Centre and the Nanny Angel Network"
"We strongly believe that the Camp Erin experience is life-changing. Family members and caregivers experiencing their own grief, while simultaneously helping their child to grieve, are often overwhelmed and feel helpless. Grief left unchecked can lead to depression, behavioural issues, suicide and substance abuse. Much of what is addressed at camp is the isolation kids feel around their grief; it is a poignant experience for the campers to have the chance to go away for three days, (oftentimes, these kids have never been up north) with other people their own age, forming a bond over their loss. 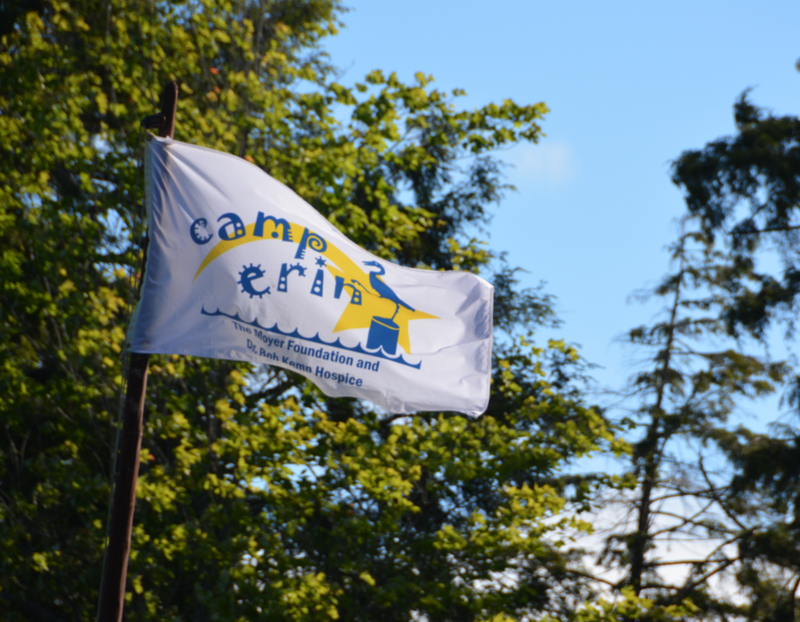 Camp Erin is a safe place for young people to identify with other kids who are feeling the same emotions, including anger, worry, guilt and often, a "Why me?" outlook. When kids come back from camp, at ease and with the confidence to talk about their grief, it gets passed along to their parents." 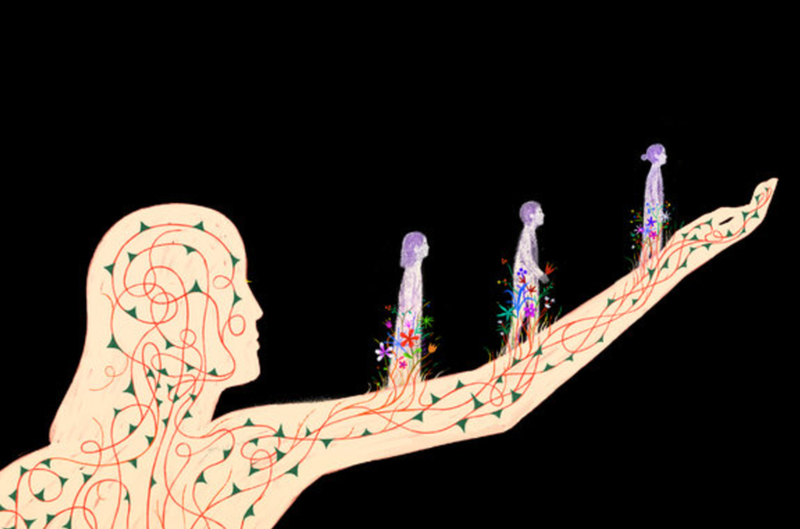 “This early interaction with death is overwhelming, but a pivotal point for learning. This grief acts as a blueprint for not just how these young people process death, but their approach to the many challenges they will face in life. "We stopped talking. I rocked back and forth on her bed, holding her close, reverting to the keening motion every human leans into when things get that bad. It was the same way I held my husband in August and again in September, and the same way he reached for me in November, the wordless soothing rhythm of a parent and child. Our guests would be okay downstairs. We sat together in the dark. And I let her cry, and cry, and cry. Broken open, edges jagged, ready to grieve". "Now comes a fine addition to the most intelligent and imaginative children’s books about making sense of death — the crowning jewel of them all, even, and not only because it bears what might be the most beautiful children’s book title ever conceived: Cry, Heart, But Never Break (public library) by beloved Danish children’s book author Glenn Ringtved and illustrator Charlotte Pardi, translated into English by Robert Moulthrop. Although Ringtved is celebrated for his humorous and mischievous stories, this contemplative tale sprang from the depths of his own experience — when his mother was dying and he struggled to explain what was happening to his young children, she offered some words of comfort: “Cry, Heart, but never break.” It was the grandmother’s way of assuring the children that the profound sadness of loss is to be allowed rather than resisted, then folded into the wholeness of life, which continues to unfold". "Drawing from over 30 years of stories and wisdom from grieving children, teens, and adults, the Dear Dougy Podcast is opening up the conversation about dying, death, and bereavement. As humans, we all experience loss during our lives, but often find ourselves lost and unsure when it comes to navigating the grief that follows. Whether you’re grieving a death, or wanting to support someone who is, the Dear Dougy Podcast can help explore your questions about grief". "Silence is not always self-imposed. Sometimes those of us who want to grieve out loud feel immense pressure to stay quiet and move on. This pressure can be communicated to us in so many ways – when people look away, when words are whispered across quiet rooms, when we are explicitly told not to dwell on negative things. When the people we love most and want to protect seem to fall apart when we talk about the dead". "When loss enters our lives, understanding how to confront it can be difficult. Rachel Stephenson learned a valuable lesson after a difficult loss and shares her wisdom on what it means to grieve meaningfully. Rachel is an educator, administrator, and writer. For the past 7 years, she has worked for The City University of New York (CUNY) designing and implementing innovative, high-performing programs focused on civic engagement, workforce development, and youth development for a range of inspiring CUNY students. Launching the CUNY Service Corps in 2013 is one of her proudest professional accomplishments. Rachel holds a Master of Fine Arts degree in Nonfiction Writing from Columbia University’s School of the Arts. This talk was given at a TEDx event using the TED conference format but independently organized by a local community". "Conversations about the end of life are hard for most people. But they can be especially sensitive for parents guiding children through terminal illnesses. They often struggle to discuss death because they don’t want to abandon hope; children, too, can be reluctant to broach the subject. But pediatric specialists say the failure to discuss death — with children who are old enough to understand the concept and who wish to have the conversation — can make it harder for all involved. A conversation could help children who are brooding silently suffer less as they approach death. It would also ensure parents know more about children’s final wishes".